It is not hard to find examples of Christians whose behavior disappoints and scandalizes us. Whether people we know personally or simply those we know about, it is easy to find ourselves thinking that others hardly seem to be “the light of the world.” There is a powerful temptation, of course, to point our finger at others for not beaming radiantly with the holy light of our Lord. Before we even begin to think about how our neighbors are doing, however, we must first take a painfully honest look at our own souls. For when we see ourselves clearly in the brilliant light of our Lord’s holiness, the darkness within us will become quite apparent. Instead of welcoming into our hearts judgmental thoughts about how others are filled with darkness, we must focus on exposing our own diseased souls to the healing presence of the Lord. Otherwise, we will become just like the hypocritical, self-righteous judges who rejected the Savior. Most of us are very good, however, at finding ways to hide in the darkness. Like the people St. Paul described in his letter to St. Titus, we would rather focus on foolish arguments and disputes that “are unprofitable and futile.” Instead of investing our time and energy in “good deeds, so as to help cases of urgent need,” we obsess about problems beyond our control and fall into fantasy about the wickedness of those we consider to be our enemies and the bad things that might happen to us in the future. This way of thinking is simply an invitation to weaken ourselves spiritually to the point that we will shed no light at all in our darkened world. It leads to shutting the light of Christ out of our souls in ways that result inevitably in slavery to the darkness. When we live that way, we will be anything but a lamp that draws others to give glory to God. Instead, we will scandalize and disappoint our neighbors by our poor witness for Christ. Today we commemorate the Holy Fathers of the Fourth Ecumenical Council of Chalcedon. They proclaimed that Jesus Christ is both fully God and fully human, one Person Who unites in Himself both divinity and humanity. They were not concerned with abstract points of theology, but with the pressing need to reject false teachings that made it impossible to proclaim how the Son of God could bring corrupt human beings into eternal life. Apart from a Savior Who is both fully divine and fully one of us, we would remain lost in the darkness of this world. We need the God-Man to bring us into His light. Unfortunately, there remains much within us that would rather hide from the light of Christ. In contrast to His brilliance, we do not want our darkness to be exposed. Consequently, we often would rather that He were merely a great religious personality, moral teacher, or political leader than the God-Man. Then we could more easily convince ourselves that we are already holy because we serve some cause that operates according to the corrupt standards of our world of darkness. Or we could rest easy that we have this virtue or have done that good deed, which at least makes us better than whoever we view as our enemies. How dangerous and subtle is the temptation to blind ourselves to the truth about where we stand before God by convincing ourselves that we are on the side of the angels because we have built ourselves up by putting others down. If there is no higher standard than how we think we compare to others or how we serve what is popular in our time and place, then it will not be hard to convince ourselves that we really do not need much of a Savior. If we go down that road, however, we will never become the light of the world. Our lives will not be different from what is conventional in our society. Instead of becoming radiant with the holy light of Christ, we will simply embody the darkness that the world already knows all too well. There is already too much so-called Christianity that does precisely that. No matter what we say we believe, we must unite ourselves to Christ in holiness in order to avoid turning the faith into some kind self-serving religious ideology that will illumine no one. In complete contrast to such idolatry, the Savior called His disciples to embody a righteousness that exceeded that of the hypocritical religious legalists who had distorted the faith of Israel in order build up their own worldly power. He fulfilled the Old Testament law in a way that demanded purity of heart, that invited people to become “perfect as your Heavenly Father is perfect.” (Matt. 5:48) Instead of congratulating themselves for not murdering others, His disciples were to find healing for the anger and hatred that are at the root of broken human relationships. Instead of resting content with avoiding physical adultery, they were to turn away from lust and all unholy sexual desire. Instead of believing they were justified in responding in kind to their enemies, they were to love and forgive them. Christ could speak to His disciples in this way because He is not simply a teacher giving them a code of conduct that they could interpret according to conventional standards. No, He is the God-Man and described what it means to share personally in His life, to be become radiant with His holy light like an iron left in the fire of the divine glory. Our Savior, fully divine and fully human, invites us to nothing less than that. No wonder, then, that as we see ourselves more clearly in His light, we will become more aware of the darkness that remains within us. That experience often presents the temptation to distract ourselves from the uncomfortable truth that we need healing beyond what we had previously imagined and that we cannot give ourselves. Some abandon the spiritual life at this point, thinking that there is no hope for them at all. Others fill their minds with “stupid controversies” that “are unprofitable and futile” as ways of taking their attention off their own brokenness. For example, being constantly angry at others or identifying the faith with worldly agendas that do not require the healing of the soul are appealing ways of ignoring our need for growth in holiness. Far better, however, is to use every glimpse of the darkness in our souls for our salvation by opening ourselves more fully to the healing light of Christ. Frequent use of the Jesus Prayer, regular Confession, and embracing the humility expressed in the prayers of preparation to receive the Eucharist are powerful means of gaining the strength to offer our brokenness to the Lord for healing. The same is true of asking forgiveness of those we have wronged, forgiving those who have wronged us, fasting according to our spiritual and physical strength, and going out of our way to serve the lonely, sick, and needy. Ultimately, our choice is either to remain in the darkness or to enter more fully into the light of the God-Man. He alone can transform us from those blinded by our usual distractions to those who shine like an illumined city on a hill as a sign of the world’s salvation. So instead of finding ways to excuse or justify ourselves, let us have the courage to see our darkness in His light and to refuse to let anything hold us back from being illumined until we shine brightly with the Light of the world, our Lord, God, and Savior Jesus Christ. 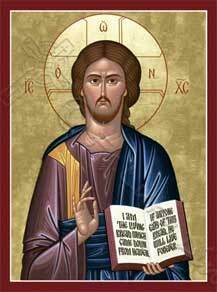 Lord Jesus, Son of David, have mercy upon me, a sinner. Thank you, Fr Philip, for this faithful dividing of the word of God. 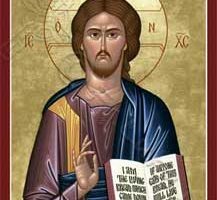 There is no doubt that each must take the courageous move, as an individual, to stand against himself or herself on the Lord’s side (1 John 1:8-10); and to trust Him as Advocate with the Father to stand in our defence (1 John 2:1-2). Only then will we step from darkness into light. This light, it seems, appears in point and counterpoint. For wisdom appears to be a skill honed by the practice of discernment. A curious phenomenon, I find, among Orthodox Christians is this: a corporate identity is affirmed but mutual accountability hardly ever presented. The world of Orthodoxy is a sacralised world rich with meaning, a lived reality which requires a sense of corporate identity in order to escape mystical solipsism. In corporate identity actualised, we share accountable sensibilities in matters of morals, vocational roles, foundational beliefs about the human situation, and identifiable examples of holiness, also known as saints. Am I missing the voice that affirms accountability of one to another, laity to clergy, laity to laity, and even clergy to laity? So very often does one hear and overhear such admonitions as “Work out your own salvation”, “Confess your own sins”, “Attend to your own business”, and “Bear witness; sometimes use words”. It would seem that the preponderance off this kind of admonition suggests an eremitical view of salvation that approaches solipsism. Perhaps there are two natural tendencies: 1) to blame the other and ignore one’s own sins; and, 2) to live quietly and responsibly in holiness to the most sincere degree possible, while avoiding engagement with widespread communal error practiced by individuals. I do sincerely wonder whether Orthodoxy has no current conception of the prophetic voice — rather common in protesting communities such as the Pentecostals or the Evangelicals — that calls people to remembrance. It seems as though Orthodox congregations or autocephalous jurisdictions do not accept the notion that they can be influenced by the world or the flesh or the pride of life. Simply put, the adage seems to be: leave the general ethos of the Church (ie. “others”) to the priestly professionals. If Orthodox does affirm the notion of prophethood as an ongoing phenomenon or office or vocation in the Church, I do wonder what this is? Naturally, it could not mean reformation of dogma, which is the preserve of the priesthood. Thanks very much for your thoughtful comment and questions. My quick response is that every Orthodox Christian’s relationship with a spiritual father should be one of accountability. Likewise, god parents are accountable to their god children. Parishioners are accountable to the clergy of their parish, and the clergy are accountable for the spiritual health of their people. Priests and deacons are accountable to the bishop, who is in turn accountable to a synod. There is a kind of mutual accountability in all these relationships, though the particulars vary according to the roles, vocations, and responsibilities of the persons involved. Everyone in the Church is a person in communion with others. Consequently, discernment is not an individualistic undertaking, but done in and through the Body of Christ.